Im sure this topic has been brought up before, but it’s my first Halloween with a Tripawd! I know I’m a couple months early, but it’s never to early to start planning. I really want to make Domino very unique for Halloween. I’ve thought of the obvious ones… a tripod, a tricycle, a pirate… But does anyone have anymore suggestions? Thanks so much! Check out these topics too, for lots of ideas and pictures! Or, see all search results for Halloween. Haha, which is funny, because the family consensus seems to be a pirate with a hook hand lol. I’ve found some very cute pirate costumes and it’d be fairly easy to fix a hook to some elastic. So who knows! No finer humor than the humor of a tripawd pawent!!! Alison, this is the first time I’ve seen Jasper dressed up as Batman! Great photo! My mom had to custom make the tail, but it is so worth it, we used this costume for the SPCA 3K Petwalk and Costume Contest. We wont 3rd place which is fitting for my tripawd girl. I wanted a costume that would be happy! I felt that the tripod (camera stand) costume and pirate poked fun at her. But the mermaid tail brought SO MANY SMILES! We got such great feedback for our costumes! Have fun everyone! Ohhh how cuuuuuuuute! This is VERY original, never seen anything quite like it! Holy Moly did you see Hank’s costume? I did indeed see Hank in Maggie’s blog…..grinned ear to ear then…and still am now! 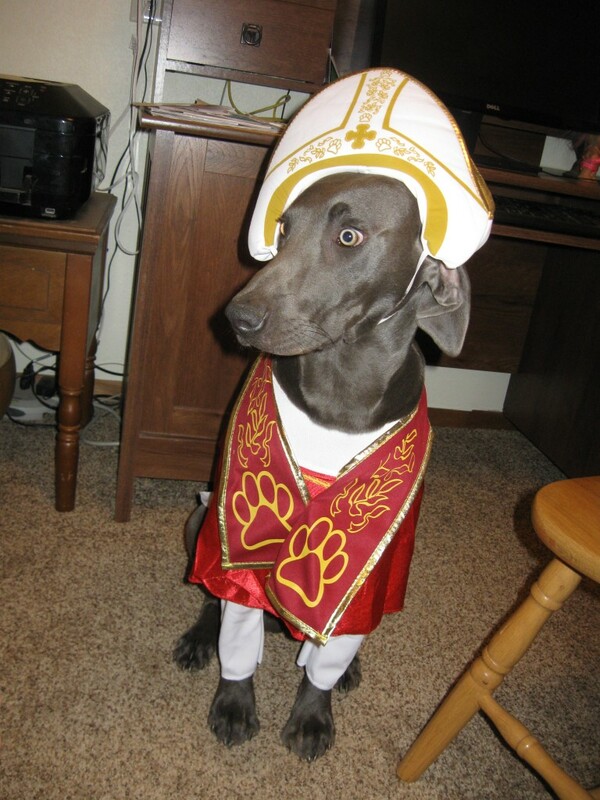 Those eyes….that look….the costume just wouldn’t be nearly as effective on any other dog!! And the Mermaid….creative….incredibly creative! She was robbed of first place last year! Robbed!!!! Post your Tripawds Howloween Costume Photos here and vote for favorites with a chance to win!